Self-love can sound like a pie-in-the-sky idea but it turns out this simple concept affects our entire life. A poor relationship with ourselves affects our mental, emotional, and physical state. So where does it start? How do we nurture self-love in our teens? And what about us? How does our own relationship with ourselves affect our lives, our family, and our parenting? Expert Paula Galli shares all this and more as she chats with hosts Judy Davis and Sandy Fowler. 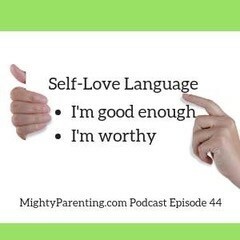 In this week’s Mighty Parenting podcast show you’ll discover the language of self-love and learn how to create and nurture self-love in yourself and in your teen. The language of self-love starts with “I’m good enough” and “I’m worthy”. Your relationship with yourself impacts your entire life. Notice how you talk to yourself in your mind and how you treat yourself. When we’re little we love ourselves and think we’re amazing. Our society influences us to focus on our faults so we can fix ourselves. Parents can put their own insecurities on their kids. What can we do if we are concerned? Open a dialogue and try to uncover the core thing that’s going on. Usually they want to control something they have no control over. Teaching teens self-love starts with the parents—love yourself. If you want to love yourself then you need to speak kindly and lovingly to yourself. Learn the language of self-love. Talk to your kids about what you’re doing. Discuss your effort to be more loving to yourself. You can even ask them to let you know when they hear you slip up. Speak to yourself the way you would speak to someone you love. Notice what you say that’s negative. Write down the opposite. When negative thoughts surface, repeat the positive thought. This helps to create new neural pathways. Give yourself time to become fluent in the language of self-love. Ask family and friends to speak this language with you. Paula Galli McDonough, Author & a self-proclaimed “recovering perfectionist”, works as a Life Coach specializing in Interior Design Psychology & Emotional Eating. Her educational background in Psychology, Life Coaching, Holistic Nutrition, Design Psychology Coaching, Interior Design & more, brings a multi-disciplined focus to her work with clients. 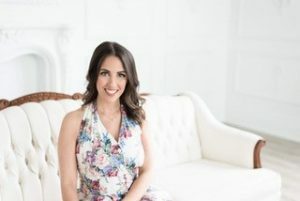 Her education combined with her own journey of overcoming extremely low self-esteem, crippling anxiety, taunting perfectionism, depression and an eating disorder, has enabled her to understand her clients’ needs on a personal level. For over a decade now she has been inspiring and empowering women to love and take care of themselves, their bodies, the food that they eat and their homes, so they can live a balanced, authentic and fulfilled life. She is the author of the book, Weighing Love & was also a contributing author to the book, 20 Beautiful Women, Volume 2. Paula has been featured in numerous print, radio and television interviews, as well as, was recognized as a Notable Young Entrepreneur. To learn more or connect with our guest visit http://paulagalli.com/.